Brandi To Perform At Obama Foundation Summit Tonight! On the personal invitation from President Obama, Brandi will join Aziz Ansari and Lena Waithe, Gloria Estefan, Andra Day, Nas, The National, Francis & the Lights, Chance the Rapper and more for a special concert and community event tonight at Chicago’s Wintrust Arena. The event, which concludes the inaugural Obama Foundation Summit, will be live-streamed via Obama.org starting at 8:30pm CT.
Brandi Joins Dave Matthews + Tim Reynolds in Mexico! The Winter Acoustic Tour 2017 dates have been announced! All shows have VIP Packages available. For more info, click HERE. *Presale underway, on sale Oct 31 at 10am PT. Thank you to everyone who bought Cover Stories in honor of my birthday yesterday. We did it! We smashed our fundraising target for War Child UK! As promised, here's the bonus tack... I hope you like it! In honor of my birthday today please click on this link https://www.coverstoriesalbum.com/ and buy Cover Stories - 100% of the proceeds go to help children in war zones. I'm turning 36, so if we sell 3,600 copies before midnight (PT), I will share an unreleased bonus track from Cover Stories - my 2017 version of "Hiding My Heart"! 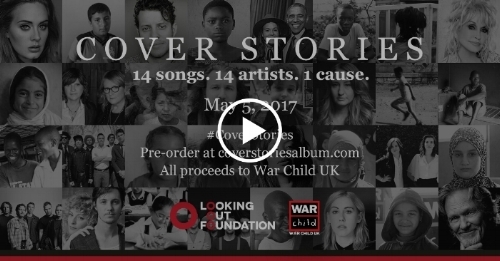 It's a win win - you get a copy of the greatest charity record ever and an exclusive track from me and War Child gets a HUGE birthday donation from all of us! Check out the official video for @dollyparton's version of The Story now! Cover Stories Has Finally Arrived! Exactly one month from today, Cover Stories will be out there for the world to hear! Thank you from the bottom of my heart to everyone who's pre-ordered the album - you're directly impacting War Child UK's amazing work to help kids impacted by war. But we need to keep the momentum going! Tell your friends, talk about it over dinner (or a Jameson), buy one for your favorite person! Let's see how much we can raise in a month! Need a little convincing? Just listen to this track from one of my heroes! Thank you to everyone who entered Brandi Carlile's Cover Stories Contest! And to those of you who didn't, here's your chance to make a difference. Public voting begins on Apr 3rd 2017, 9:00 am (CT). The voting period closes on Apr 17th 2017, 9:00 am (CT)! 1) You can find all videos entries on our Cover Stories Contest site here - https://coverstoriescompetition.strutta.me/gallery this is where you can cast your vote. 2) Once the voting round opens, a vote button will appear underneath the entry. Click on the "Vote For This Entry" button on your favorite entry's page. Log in with your Facebook account. 3) Any votes made from your account after this initial account activation will be counted instantly after logging in! 4) Sharing will not get the participant votes. But please use the share tools to facilitate sharing on social media sites. Thank you for helping us make someone's dream come true and for raising awareness for #CoverStories! Due to the large amount of rain in southern California, the John Anson Ford Amphitheater will not be open on May 5 so we are moving Brandi’s show to the THE ORPHEUM THEATRE. If you already have tickets, you will be contacted and sent new tickets for the Orpheum show via the same delivery method as the original tickets. The tickets for John Anson Ford will NOT get you into the Orpheum so make sure you receive the new tickets. Nashville, one show wasn't enough! We've added a 2nd show on April 25 at the Ryman Auditorium! Get your tickets NOW. VIP packages also available. I'm thrilled to announce that we're going on tour in April! We are headed to a series of intimate venues to commemorate the 10 year anniversary of "The Story" and we'll be playing the entire album acoustically from start to finish! There'll be lots of other stuff played over the course of the show too! Older songs, requests, covers, rants and of course there will be Jameson. Come celebrate ten years of The Story with us!! Check out this old school pic of me in the studio with T Bone Burnett making The Story - he liked it REALLY cold in there! Pre-sale starts Tuesday, January 10 at 11am HERE (no password required). Public on sale starts Friday, January 13 at 10am. All local show times. Please join Brandi and special guests on Sunday December 4th for an intimate evening at Town Hall Seattle. Brandi and her band will perform an exclusive set, completely unplugged as a continuation of her groundbreaking Pin Drop Tour. All proceeds will benefit the Looking Out Foundation. By supporting The Story Campaign, you're joining the Looking Out Foundation and War Child UK in their to work give children a chance to learn, to earn, and to grow up safe and strong in some of the worlds most chaotic conflict-affected countries. Don't miss your chance to join Brandi and special guests for what promises to be an unforgettable evening. Public on sale starts 9/16 at 12pm PT at brandicarlile.com. VIP Packages are also available and include: Tickets to the show, Meet & Greet with Brandi & the Twins, early entry with soundcheck, exclusive Brandi Carlile merchandise, and more! Whoa, there are quite a few more show cancelations these past few tours than I am comfortable with. I'm really sorry about that. I always say that I'm actually way more of a fan than an artist and I know at the deepest possible level what it is to wait for a show, fly in, and stand outside of a tour bus for hours just to get a photo and a hand shake. That is why it really bothers me to cancel the shows coming up. So I wanted to reach out about not only September but the last couple of cancelations this summer. In the last few months I've started having some back and pelvis problems from endometriosis that were slow evolving and didn't seem super serious. I ended up with a hemorrhagic cyst in July but because I had good days and bad days and it wasn't super painful or damaging, I was sure I could get through September. The trouble is that it just got worse and worse and I was putting off getting a simple surgery so that I could do what I love and finish the tour. Finally, as these things do, my health issues made the decision for me and even after touring with a lovely chiropractor to get me onstage (btw if you ever want to feel old...) I am just unable to put on focused and honest show right now. That's why I have to take a couple of months off to recover. I am going to get that simple surgery and then we'll start getting ready to make the next record. It's going to be an introspective fall and I'm looking forward to being able to rough house with Evangeline properly again! Thank you for all your well wishes and patience during this time. I want to share with you one defining lesson I've learned from this - we live in a part of the world where we have (evolving) access to health care and specifically women's reproductive health when a devastating number of women in impoverished countries are still dying from very curable and preventable reproductive issues. Let's not skip our annual appointments or ignore our women's health issues out of respect for that privilege and the women who don't have it. Sadly, we suffered a loss in our immediate family yesterday and we will have to cancel this week’s upcoming Canadian festival appearances in Quebec (July 7), Montreal (July 8) and Ottawa (July 9). We would like to thank all of our Canadian fans for their support and understanding. We look forward to returning to Canada soon. Our summer tour will resume next week in Buffalo on July 11th. We are inviting existing ticket holders to join us for a VIP Soundcheck Party at RED ROCKS Ampitheatre on August 14th! Please email brandicarlilevip@gmail.com to find out more and upgrade your current tickets to a VIP experience! * A portion of the proceeds will benefit the Looking Out Foundation.